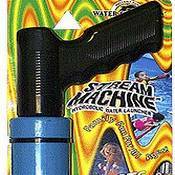 The Stream Machine Water Launcher TL-600 is designed for the younger members of the family ! It's size is approximately 12 inches, which makes it easier for short arms, But it still packs the same punch as it's big brothers. it's perfect for around the pool.Shoots up to 70 feet !Re-Load Faster than your water battle opponent.